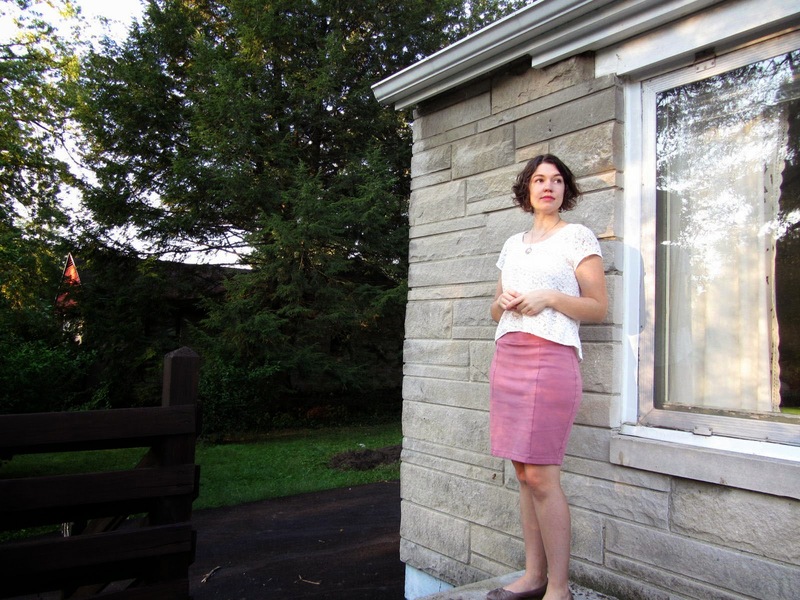 OWOP Day 1 – Lily bodice with simple gathered skirt out of stretch cotton pique from FabricMart. Accessorized with a braided coral belt from the thrift store and a lackluster Sunday blues face (anyone else get depressed on Sundays?) 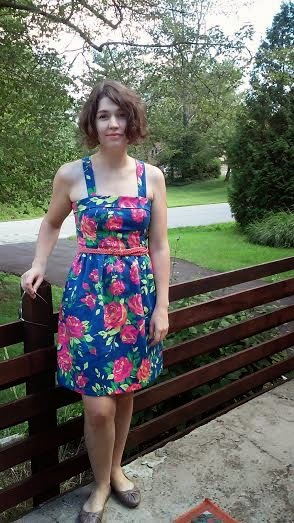 This is the only dress version of Lily that I’ve completed, and I have to say I’m less enamored with the top half of this pattern than I am with the bottom. The fit just wasn’t as good. The princess seams fall a little too close together for my bust, the straps ended up being way too short (I had to cut new ones), and overall the bodice just seemed too short for my torso. I couldn’t figure out whether I wanted to tug it further up or further down, but probably I could extend it a little both ways for a better fit. However, after sewing in some foam bra cups to the lining it is quite comfortable. It also requires very little fabric – I think I eked this out of 1 1/2 yards. Not bad! OWOP Day 2 – Navy Lily skirt. My first version, and a good wardrobe staple for work. I’m wearing it with a blouse I made from a 1970s pattern a long while back. 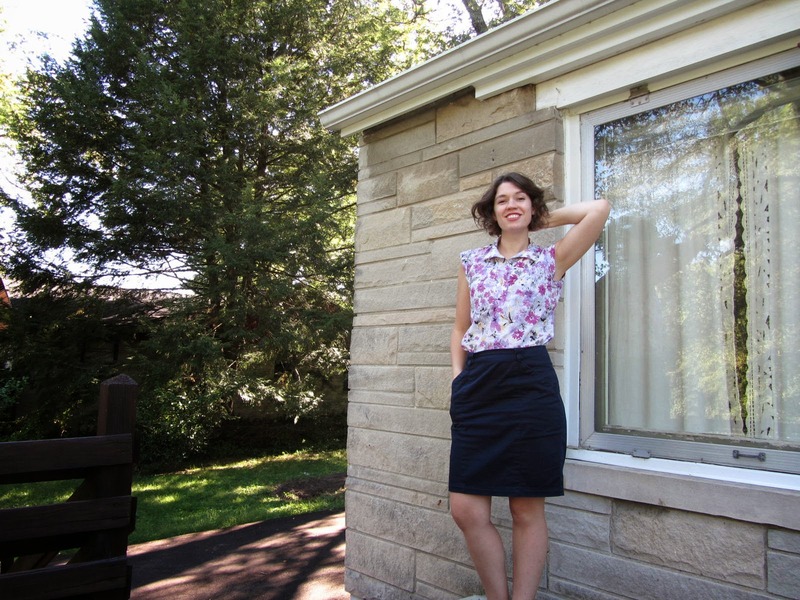 OWOP Day 3 – The third skirt version I made from the Lily pattern, this time out of a ponte knit! I’m quite proud of this one because it’s one of my first forays into knitwear, with the exception of swimsuits. I had been eyeballing the Mabel pattern from Colette Patterns, but couldn’t fit it in my sewing budget and also had the suspicion that I could manage on my own without a pattern. And then I was struck with a moment of genius when I realized that it wouldn’t take much to adapt Lily for knits. I already had a waistband drafted, more or less, in the form of the facings I made for my skirt versions. From there it was a small matter of eliminating the front pockets and using slightly larger seam allowances to account for the stretchy ponte. I am super pleased with how well this worked, and how fast it was. I made this up in just a few hours on a Sunday evening and wore it to work the next morning. Why has it taken me so long to befriend knits? I’m psyched to try a zillion more knit projects, including several more Lily skirts. 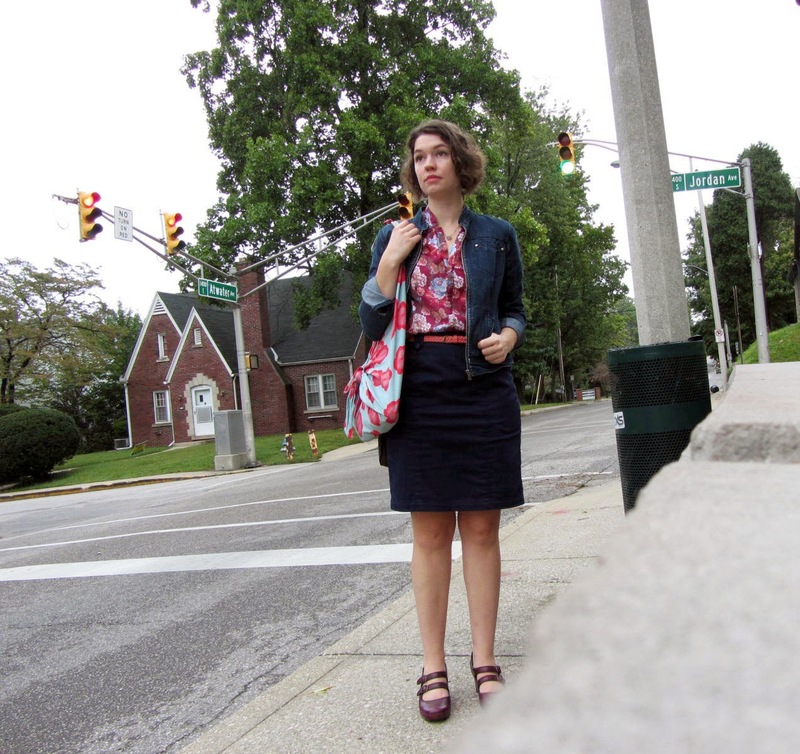 OWOP Day 4 – My bright floral Lily skirt. It’s hard to repeat this one without people noticing, but I love it anyway. 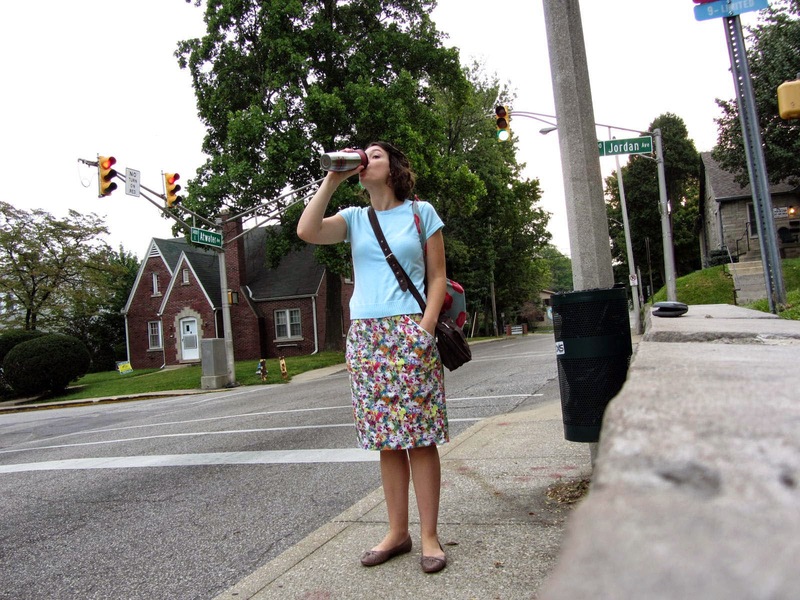 OWOP Day 5 – My navy Lily skirt again, with my Vogue 1387 blouse. I resorted to taking photos while waiting for my bus, which was a tad awkward. Also, I need to replace my broken tripod so I don’t have to find stone walls of a certain height to perch my camera on. 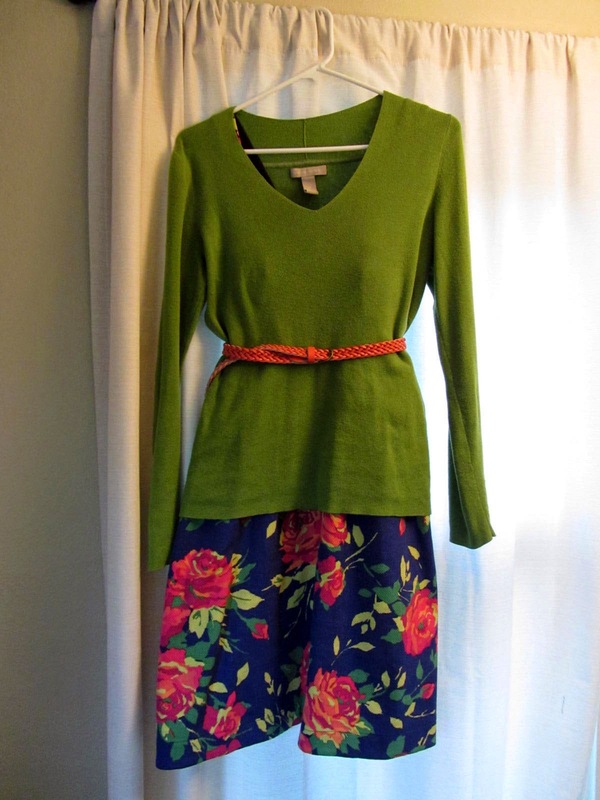 OWOP Day 6 – Lily dress again, with green sweater and belt. I forgot/didn’t have the heart to take photos of myself on Friday. I did get a few nice compliments for this outfit. It was hastily thrown together because the weather suddenly took a turn for the cooler, which threw my OWOP wardrobe plans awry. 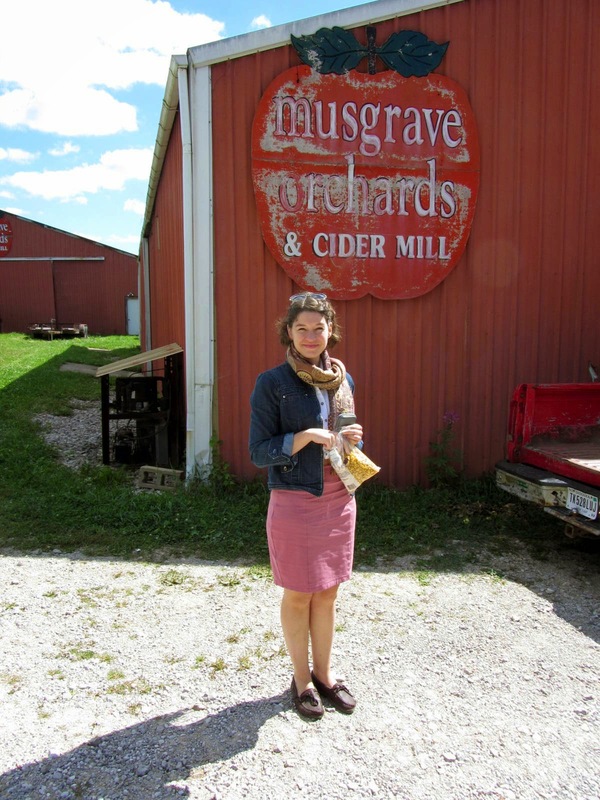 And finally, OWOP Day 7 – Ponte Lily skirt with jean jacket and moccasins for a drive in the country to get apples. All in all, I had a fun time with OWOP, especially since it’s my first time trying to stretch my homemade wardrobe. I’ve never participated in me-made-May, but maybe next year I’ll be ready! On the other hand, I would have liked to stretch this pattern a little further. I’d like to make a version that’s true to the original pattern – a full dress without substitutions for top or bottom. I also would like to make a top out of just the bodice, and I actually got 80% done with one. In the end I ran out of time, and the weather got too cool anyway. I love the idea behind OWOP – that you can wring every last bit of usefulness out of a good pattern. It appeals to my inner cheapskate and also my interest in drafting and pattern modifications. I love the variety of beautiful patterns available to us these days, but I also tend to look at every new arrival to check if it could be made with a few tweaks to something I already own. With a little more disposable income maybe I would just buy all the patterns, but then again, using a tried and true pattern means you don’t have to go through fitting headaches. The only onerous thing about OWOP is having to take photos of myself, and I think a lot of other agree that this is the hard part. But it’s good practice too and good to remember that no one is really going to judge (and f’ them if they do). A last note before I sign off. 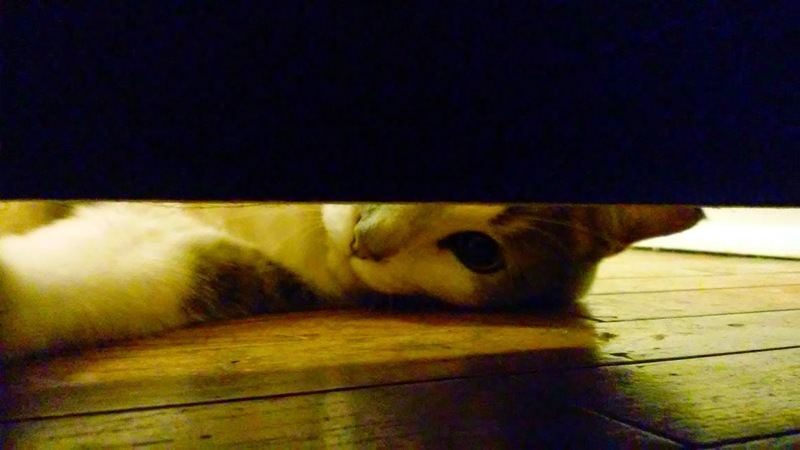 One reason I’m late in posting these is that our cat, Pidgin, has gone missing. He was actually last seen last Friday morning, and Josh and I are both feeling the loss. I know he may come back still and also that he might not. Since he made a debut on the blog when we first brought him home and has made a few appearances here and there since, I thought I would say something and leave you with a photo of his adorable face. Lovely outfits! Isn't it nice when you've made enough things that you can wear them together?